It’s that time of year. Dove season is in full swing, college football is back, the weather is teasing us with the thought of cooling off, but of course, not fully yet – at least, that’s the case in the south. 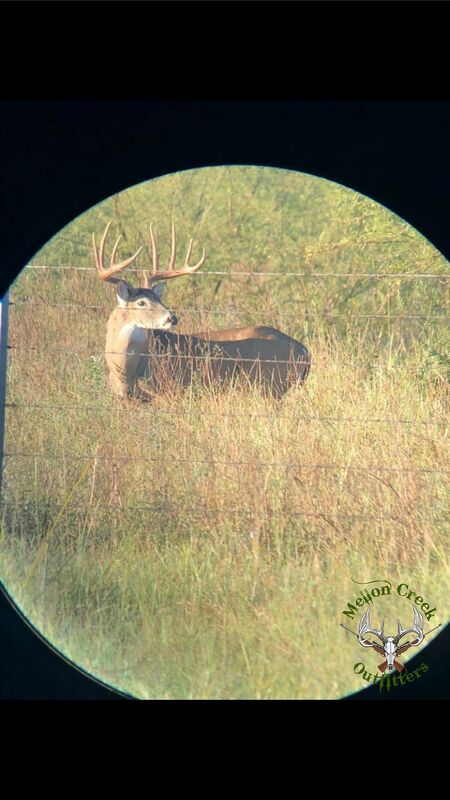 Bow season is just around the corner; for Mellon Creek Outfitters in south Texas, we are anxiously awaiting October 1. We’ve captured some fine Whitetail bucks on camera this summer. Also, one of the most exciting additions to the ranch has been the WiseEye Smart Feeder. You can watch the feeder in action on CarbonTVs WildLifers Next Destination Live Cam. We are now 10 days away from the bow season opener, and a game plan is beginning to emerge. Through months of research, we’ve pin-pointed the best stands for our clients for opening week, and we are ready to watch the game unfold. In this day and age, there is a device for nearly everything and technology that far surpasses your own understanding, but when you hear of mistakes being made by hunters, they are typically mistakes that could have been easily avoided. So, here are a few pointers to make the most of your hunt. When you’re staying at Mellon Creek Outfitters, we truly do our best to provide you with wonderful lodging and food, and we can certainly understand how comfort can cause you to hit the snooze button a time or two. However, it’s crucial to set your alarm and be ready to go when the guide tells you. Telling someone to be prepared probably could cause a few eye rolls; however, if you wait until last minute to pack your bags, you’re probably going to forget something. Be sure to create an inventory list – know what you have. Also, definitely don’t wait until the morning of the hunt to pack your bags. Have you ever gotten to the stand and forgotten your release or range finders? Most people can shamefully admit, “yes.” So, make sure all of your gear is packed strategically for quick access. We’ve all been there – checking a score to a game, texting a buddy to see if he is seeing any movement, or taking a picture of the sunrise gleaming through the trees. Time and time again, you hear the same story: “I was on my phone, and the buck I was after presented himself, and I was not ready.” So, we recommend accepting the fact ahead of time that you may experience a little boredom, but it’s better to have an hour or so of your mind wandering than missing an opportunity to harvest a nice, mature Whitetail buck. We love good food; we have some amazing chefs at Mellon Creek Outfitters that provide an incredible, delicious spread for breakfast, lunch and dinner. However, we do realize that when you’re in your stand, sitting still, and getting bored, you might encourage yourself to reach in your pockets and pull out a snack. It’s a good rule of thumb to simply resist snacking on a short hunt. Now, let us be clear, if you’re planning on sitting all day long – then, by all means, don’t pass out from low blood sugar or hunger, but if you’re only sitting for a few hours, then taking a break, and then going back out there, then allow yourself to get a little hungry and know that when you return to the truck, lodge, or your home, you can eat all that your heart desires. If the conditions aren’t right, don’t force a sit. Whether it’s too hot, incredibly windy, or storming, don’t try to weather the storm, so to speak, just for the principle of being able to hunt. By trying to control the elements and defy nature, you’re more than likely setting yourself up only for frustration. Use the time that you would have spent sitting in elements that are highly unlikely to yield success and put that effort into planning your next sit. While the tips above are surely simple, they are issues that can truly blow a hunt. Far too often you hear of people getting busted with an iPhone X or a Little Debbie cake in their hands, so please, try not to be that guy or girl! Also, remember that sitting in unfavorable elements and going in with a negative mindset will typically only yield frustration; choose your hunts wisely and resist the urge to force a sit. Be sure to share your adventures with us using the hashtag, #wildliferstv.